Blue light is a compound of virtually all visible light, and during the day these blue wavelengths help keep us awake, boost attention and positively impact mood. Natural sunlight contains blue light. Indoors, energy-efficient light bulbs, artificial lights and digital devices (including cell phones, tablets, laptops, and desktop computers) all emit blue light. This continued exposure to blue light can significantly disrupt our circadian rhythm, which impacts hormone balance, body temperature, and digestion. Blue light exposure in the evening also dramatically impacts the sleep-wake cycle and regulation of sleep patterns as it reduces the natural production of melatonin. In addition, continued exposure to blue light can damage the eyes. The more time we spend on digital devices, the more our eyes are exposed to blue light. It’s not uncommon for an office worker to spend the majority of the day looking at a computer screen. After work, we may watch a game or program on TV, pay our bills online, and then connect with family and friends via social media, email, and text. All of these screen time activities add to our exposure to blue light. Lutein and zeaxanthin, common dietary carotenoids, are antioxidants located in the eye. Naturally found in kale, spinach and other dark, leafy greens, lutein and zeaxanthin concentrate in the macula of the eye, and help filter harmful blue light. The body doesn’t make lutein or zeaxanthin, so these nutrients must be consumed through diet or supplementation. 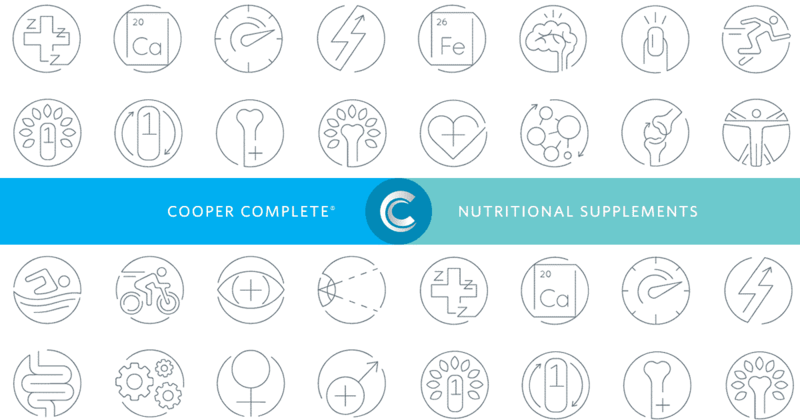 The level of lutein and zeaxanthin in Cooper Complete’s comprehensive eight-tablets-per-day multivitamin and mineral formulations is based on lutein and zeaxanthin consumption levels as found in Three-Day Food Records submitted by Cooper Clinic patients and analyzed by The Cooper Institute. The Cooper Clinic patient has a healthier diet than the average American, so the higher level of 10 mg lutein and 2 mg zeaxanthin is not required. To learn more, watch this video explaining the eye health infographic and blue light. Article provided by Jill Turner, President of Cooper Complete nutritional supplements. Note: This Eye Health Infographic is copyrighted to Kemin Industries, Inc. and DSM Nutritional Products.